Un cañón sobre la base del chasis del MS. Este modelo existe solo en planos. No se llegó a realizar un prototipo y nunca se produjo. This tank has many of the same characteristics of the MS-1, which is obvious seeing as it is one of its variants. On the arty side of things, it is similar to its counterparts: short range and good rate of fire keep it fun and simple. Unfortunately, its gun elevation keeps it from performing well as a TD. If you enjoyed the MS-1 you just got out of, then you'll feel right at home in the SU-18. It has the same hull and engine, right down to the distinctive put-put-put sound. The SU-18 is slow and has a fairly short range. On the plus side, at short range you can lead your targets more easily due to the reduced shell flight time. Armed with a 76mm gun similar to that of the T57, it has good accuracy and rate of fire. It's a good platform for trying your hand at artillery combat. Just remember that in a straight-up fight you are actually worse off than you were in your MS-1. You have no turret to aim with, so stay well hidden as far back as you can manage while still being in range of the enemy. The SU-18 is a pretty effective artillery piece. It paves the way for the play style of the next two Russian SPG's. Its greatest advantage will be the extreme rate of fire. It will normally be facing low-tiered tanks, and with this high fire rate it can destroy any tank it encounters. Its small size allows the SU-18 to hide in small bushes, shrubs, and be extremely difficult to find and hit. Be sure to move up with your team constantly, however, because of the gun's very short range. Fortunately the engine upgrades for the MS-1 carry over, so you should mount the AMO-3 engine immediately upon purchasing this SPG. Research the 9RK radio before proceeding. The SU-18 is a variant of the T-18/MC-1. In November of 1929 ANII K. M. Ivanov, commissioned by the UMM RKKA, produced a self-propelled gun based on the T-18, as well as the ammunition carrier for it. The prototype was a captured French Renault FT-17BS. 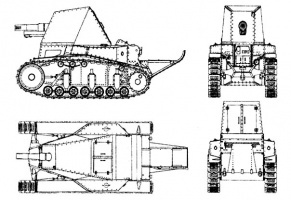 The SU-18 kept the same design as the French vehicle, but replaced the tower with one that resembles a truncated pyramid. The SU-18 used the 76.2-mm regimental gun model 1927 with a slotted muzzle brake to reduce rollback. It had an ammunition capacity of 4-6 rounds and no machine guns. Other prototypes were created using a high-power 37-mm PC-2 gun and a 45-mm model 1930 tank gun, which was planned to be installed on T-24 tanks. Armor consisted of 5-7 mm thick plates. The ammunition carrier could hold 10 trays with 50 rounds each of 76.2 mm shells, or 16 trays of 169 shells each of 37mm or 45mm guns. The crew consisted of one driver and one gunner. The decision to build the SU-18 was made on June 11 and stipulated the delivery of a prototype by October 10, 1930. However, due to the small ammunition capability and the limitations of the T-18 (a narrow gauge chassis and a high center-of-gravity), the design was abandoned in favor of larger and better self-propelled gun designs, and further work on the SU-18 was stopped. Esta página fue modificada por última vez el 25 oct 2016, a las 10:19.